Got Squirrels? Mr Electric to the rescue? A call, a regular call on the way‚ or so I thought! I pull up to the residence and take a few moments to compose myself as I prepare to embark upon the last call of the day. I roll out my Mat in the doorway and knock a few times then step back away from the door and a little to my right to place myself in easy view of the window to the side of the door. A few minutes later I am in the foyer listening to what the homeowner has to say about the reason for the call. The lights are out in this section of the house. I take a few minutes to listen to the symptoms and then to go over the pricing and, after he agrees to the diagnostic, initiate some paperwork. Now it is time to wave the magic wand; which, I feel, may involve a trip into the attic‚ NO power to the switches beside the door, AH HA! After exhausting all possibilities in the living area, I make the decision to bring the ladder in and go up into the upper regions of the house, aka, the attic. Nice attic‚ ones that can be walked around in. Donning the appropriate garb I climb into the darkness, headlamp lighting the way. A sea of insulation and rafters and toward the problem area I can see an odd mound of dis-similar insulation. I make my way that direction and realize that the homeowner at the top of the ladder is not the only spectator to bear witness to my troubleshooting endeavor. A squirrel is watching my every move from the corner of the space that I am heading toward! I am not too sure at this point if he/she is blinded by the beam of light from the headlamp or if there is some other reason why he/she is not scampering away‚ I do know that I am going over to this mound of Pink insulation oddly placed in a sea of white. Carefully, and under the watchful eye of my furry witness, I start to pull aside the pink. Lo and behold! There are pink shapes wiggling around! Babies! I turned to the homeowner and reported what I found, he could see me but not what I could see. With his help, gloves and a basket, I was able to remove the babies and place them in the care of the homeowner. Under the nest there were several electrical wires gnawed bare of all insulation! The copper color of the wires was quite apparent! The wires had shorted together resulting in the loss of power to the circuit. The squirrel babies found a new home and the potential for a fire has been averted! All in an afternoons work. I was able to splice together the wiring utilizing the placement of a few junction boxes thus eliminating the bad wiring. The homeowner was thankful and now dedicated to the task of figuring out how they got in! When a light or an electrical outlet stops working there is always the possibility that there could be a loose connection that could lead to a potential fire hazard, best not to take chances and that is for sure! In the field of service work we see dangerous situations on a weekly basis that, often times, could have been much worse if immediate action was not taken. 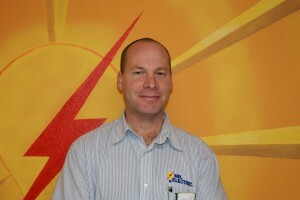 Written by Brian Simmons Mr. Electric, Clark County, Vancouver, Wa P.S. Thank you Brian for going above and beyond the call of duty! Readers will be happy to know that the baby squirrels were adopted by a loving neighbor. This entry was posted on Wednesday, April 14th, 2010 at 7:04 pm	and is filed under Life as an Electrician. You can follow any responses to this entry through the RSS 2.0 feed. Both comments and pings are currently closed.